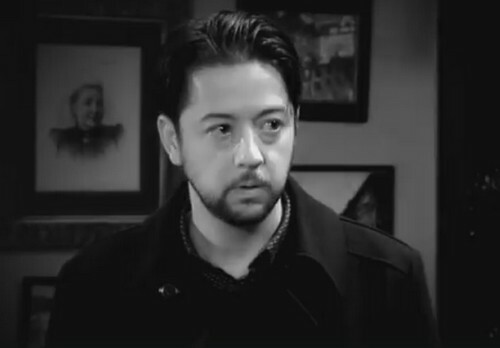 General Hospital (GH) spoilers tease that Spinelli (Bradford Anderson) will have a chance to weigh in on all the Jason (Billy Miller) twin drama. He certainly looks taken aback in the latest GH promo. Spinelli could find himself feeling torn once he sees Patient Six (Steve Burton). It didn’t take long to convince Carly (Laura Wright) and Sonny (Maurice Benard) that their good friend was back. All Patient Six had to do was say “It’s me” and the warm reunions began. Spinelli may approach this more scientifically. He might want solid proof before he throws current Jason under the bus. GH gave us some hints about where this story was headed when Jason was in a coma. Sonny and Carly repeatedly talked about how Jason hadn’t been himself since his accident. The show set them up to side with Patient Six. With Spinelli, General Hospital took a little different approach. It seems like they were playing up the connection Spinelli still feels to Jason. They highlighted Spinelli’s despair and the bond he wanted to keep alive. Of course, things are different when a character actually comes face to face with Patient Six. It’s tough to look at Burton’s character at not think of him as Jason Morgan. Still, Spinelli may decide he owes Miller’s Jason his loyalty – at least until real evidence surfaces. In fact, Spinelli might play a role in finding that evidence. Sonny and P6 will rely on Robin (Kimberly McCullough) as they search for Drew details. They’ll hope Robin can answer some questions about Jake Doe. Meanwhile, Curtis (Donnell Turner) will continue to support Jason’s efforts. All of that assistance is great, but a tech geek like Spinelli would be useful as well. Anna (Finola Hughes) will remain involved in this story through her Andre (Anthony Montgomery) connection. Many GH fans suspect the mini disco ball contains all of Andre’s research. It’d be easy to plant a chip in there for safekeeping. If Anna figures that out, she could give Spinelli something to go on. He might even find a way to undo the memory mapping damage. Several characters will help the twins with their mission to learn the truth. Let’s hope Spinelli will be a key player in the shocking discoveries ahead. Are you excited about Spinelli’s return? Will he side with Miller’s version or at least keep his options open? General Hospital spoilers say the action’s about to rev up, so stay tuned! We’ll give you updates as other GH news comes in. Stick with the ABC soap and don’t forget to check CDL often for the latest General Hospital spoilers, updates and news.